Its been one of those weekends. You know, quite angry, quite all over the place, feeling emotionally fragile. Yesterday I got myself worked up about going up to the cemetery. 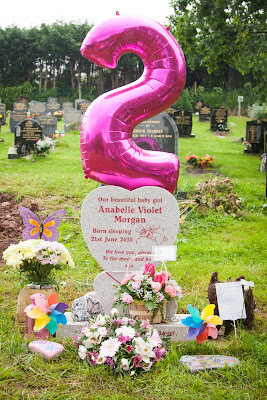 The build up going to Anabelle's garden is becoming quite an ordeal for me. For some reason I'm not coping with it all so well at the moment, I'm not entirely sure why its become a bigger deal but it has. We don't go as often as I feel we should, and for that I feel perpetually guilty. I'm finding it increasingly difficult to emotionally deal with the mess and tidy up there because we are leaving it longer in between visits. It doesn't feel comfortable or comforting there at the moment. I can't do enough for her, nothing feels enough. Everything feels overwhelming and so wrong. I find it difficult taking Alexander there; I'm not sure why. Possibly because he represents everything Anabelle should've been. Possibly because my fear of that grave being his fate is never far away. Possibly because he makes me so happy he is part of my guilt. But evidently, at the moment I'm not in a good place with garden visits. Yesterday we were going to go; but I got myself into such a state it just didn't feel like the right day to go anymore, so we put it off again. Instead we've been today. Like everything this build up is far worse than the event; tidying up today wasn't as traumatic as I thought it was going to be, infact I was pleasently surprised how tidy it was there considering we've not been for six weeks. Six weeks, and there lies my biggest guilt. What excuse have I got for letting so many weeks slip by? I can't really blame it on being busy. Its not being busy. Basically the problem is me, I'm finding it harder to face up there. I don't understand why it feels harder at the moment. Nothing has fundamentally changed. We should go more often. If I showed such little interest in Xander for six weeks I would be accountable to my health visitor, social services. If I neglected him I would be called up on it. But, because she is dead I'm not accountable for not being brilliant for Belle. Then today, to top the weekend off, yet again I've been made to feel the need to justify myself, explain myself. We could call this post exasperated (two). Something precious to me tainted because I used a sweeping excited statement, and offence was taken to it. There I go unintentionally hitting those nerves again. Goes to show the importance of more carefully choosing expression and turn of phrase though. Yup, here she goes again... playing that dead child card. But you know what, Anabelle death and absense colours everything, dominates our family. This is our reality. This. For our baby's birthday so far we've got to stand over their grave, cry, send ceremonial balloons into the sky, buy flower posies, garden ornaments and a big number balloon to decorate her garden. So I shall not be apologising for being overly excited or indeed over the top with my expectations for Alexander's first birthday. Unless something goes horrifically wrong for our family in the next few weeks his birthday is going to be worlds apart from his sisters. For a start he will be alive. So in comparison to Anabelle, which is where all my comparisons normally lay, having the 'best' first birthday isn't going to be very difficult is it. Birthdays hurt me, all birthdays. Going to any child's birthday party these last few years have been a source of enormous pain for me. However much we love them. I had hoped Alexander's birthday was going to be the start of some healing; a precious party we've never been able to have in quite the same way for his sister. I thought after holding a party for Xander everyone else's birthdays would start to get easier too. Because finally we would've shared in that joy for one of our children. I thought people knew me better than this. Understood me better than this. Could see the bigger picture for our little family better than this. I'm incredibly upset that it could be believed that I would imply other parents in my circle of friends are not doing a good enough job for their children. That my excited expression of 'the best birthday' could be twisted into something of me being nasty, cruel or interpreted as criticising other peoples party choices. Because quite frankly the thought to compare in this instance wouldn't even cross my mind! It is astounding that my excited statement has been taken so completely literally. I'm not ridiculous, I do know at literal value it is a far-fetched, unproven claim. But no more far-fetched than those of us who gush in a moment of love or excitement that they have the best sons, daughters, husbands, wives, mothers, fathers, friends, dogs, cat etc etc. Should offence be taken to all these statements too?! Because surely by making such a statement you are implying my family relationships are crap. Well of course not. So no, Alexander will not be literally having the 'best birthday a one-year old ever had' as I dared to gush last night. My implying 'the best' is just a mother's excitement. My declaration that it is a big deal for us doesn't automatically equal me saying 'a bigger deal than your baby'. I would never literally imply that. All baby's birthdays are important to their parents, our reasons for his birthday being so important is just different to others. I'm not spiteful, I certainly do not claim to be more important than anyone else, or Alexander more important just because his sister died before him. I just use this space to record our lives; and right now the big deal for our family is his first birthday and the fact he is actually here to celebrate it instead of us grieve. Caz, I am so sorry that you have to deal with this stuff and justify your emotions about something so special. I find it mind-boggling that anyone would take offence at the comment you made. If everyone took everything people say in Facebook statuses (i'm assuming this is where your comment was made) literally or personally then we'd be facing WW3 by now! You have every right to be so excited about X's birthday, as any mother would, but especially as a mother who has had to celebrate birthdays in a cemetery and for whom X's day of birth was such a culmination of relief, fear and rainbow happiness. You enjoy your beautiful day with your lovely family and forget those who try to make it about themselves. I have found the competitiveness of mothers hard to deal with since having my little girl. My whole NCT group seemed to be trying to win some baby competition that I had no idea was going on! It was all "whose baby weighs the most", "whose baby sat unaided first" etc etc but all I cared about was enjoying my girl and celebrating every moment for us and not others. In the end I distanced myself from these women as I couldn't take it anymore. How anyone could interpret your status as that, I don't know?! You're one of the most real people I know. You're so honest. You mourn what needs to be mourned & celebrate what needs to be celebrated. Keep being who you are Caroline! And re. Belle's garden - it's a very special place, but it's physical *symbol* of the love that you will never lose for Belle. Not visiting for 6 weeks doesn't mean you love her any less - that won't change & that's most important. If it's difficult for you to go, look after yourself a little & only go when you can, like yesterday. You absolutely should NOT feel bad that you haven't been going to Belle's garden as much as in the past. It's a lovely spot but it's not the only place you think of her. She's in your heart all the time and your memories of her, your dreams and aspirations have influenced every minute of your parenting Alexander. Belle's life changed yours and nothing you do now can change that or reduce the impact she had on you. Your love for her is constant and immortal. It doesn't rest on the state of a graveside or anything else. Of course Alexander must have a wonderful birthday - it will be the best ever and we all wish you so much joy on that day. You've come a long way to get to that day, through darker moments than most of us will ever know. You have it as you want it and you describe it as you wish and anybody who thinks anything other than 'good for you' needs to REALLY get over themselves.